Advanced Home Care and the American Heart Association’s Go Red For Women Movement are seeking the Guilford Go Red Women for 2011! You can nominate yourself or another Guilford County woman who is a heart attack survivor, a heart disease survivor or who has made lifestyle changes in an effort to help prevent heart disease. Videotape your personal experience with heart disease or with improving your lifestyle and then download your video submission by February 21 at www.facebook.com/goredtriad. Three women will be chosen by a judging panel and the winners will be announced on February 28. These women will be selected to represent Go Red For Women in Guilford County on billboards, in ads, at events and in the media throughout the year. They will also be regular contributors to the Go Red Triad website and facebook site. Great prizes, a spa make-over by About Face and year-long recognition await the Guilford Go Red Women of 2011. For more information, visit www.heart.org/goredtriad. Don’t live in Guilford County? No problem. 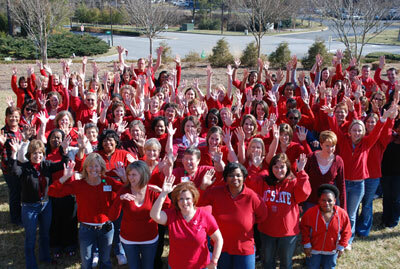 The American Heart Association is looking for Go Red Women nationwide. Find out more by clicking here. And to learn seven things you can do now to improve your heart health, check out Life’s Simple 7TM. Stop in and visit one of our 27 retail locations.